Today my 5 year old handed out valentines to his family and including one for himself. I glowed, he gets the ‘love yourself first’ principle. This is that in order to love and give with no expectations to everything and everyone, you need to be full of love yourself. As mothers, I and most other women I know, we give without even thinking about loving themselves. My journey of self-love began four years ago, I promised myself, that I was going to love myself and own my happiness. It was a year after I had my third child, when I went back to my career, that I got motivated to change. Guilt was winning, between work, marriage, children, the house, and I am too ambitious to let that continue. I was especially motivated by my mother’s stage IV cancer diagnosis. What do I want to remember when I was older? I want to be amazingly happy, love fully and live of life of no regrets. The first year was exploring this whole concept. Sometimes it worked and sometimes it didn’t. I would still look to others for validation and love. I went from full time to free lance, from a to-do list to dream list and from mom-first to me-first. With a mortgage and 3 kids these were risks, but this was my year to be brave for me and my family. This explorative year tested me and my relationships to my core. The odd thing was, that even though there was instability, I felt in control, and so I kept going. The second year is when things really shifted. I was more productive at work, even though there was less expected, and no ladder to climb. I spent time doing nothing, even though I had ‘list’ to do. Quickly, I realized how I love to just sit have tea and not even worry about my ‘list’. Stepping back from the social scene was also a necessary step at times, and a bit lonely at times, but very peaceful. Self-love was stabilizing, and there was no turning back now. Filling my own tank of love took away the need for validation and others to love me before I was happy. Sure, when I got loved it made me that much happier, but it was not the basis of my happiness. What I learned most about loving myself and have shared with many others over the past 2 years is that it allowed me to love more fully and be truly joyful on the inside and connected on the outside. Along with wanting to increase my happiness each day and not ever turn into a bitter woman (that is reason enough), the woman in me wants to love more. As a mother, I have learned that raising children needs me to love and when it gets hard, love harder. I mean there are days of tough love, but I have more capacity and find I am getting frustrated a lot less and the family appreciates this too. When I sense my ‘tank’ is going down, which it still does I start to get frustrated, impatient and stressed out. I have even gotten to a low where I felt I was scrapping the bottom of a rusty tank.During difficult periods, it seems that I should focus on those situations and try to manage or just be patient. However, the only thing that works is taking time for myself, loving and appreciating myself and then going back out into the world with an overflowing tank. With 3 kids, this is an amazing way to feel. Love is a vitamin in the holistic nutrition world, we call it Vitamin L. Love, hugs, appreciation give us dopamine and makes us feel good. This is a critical component of our nervous system and we need to keep it stable. Yes we need other nutrients too, but if you observe a kid and how many hugs they reach for everyday you will realize touch and love are some very important nutrients for humans. This is science, my friend, science beyond textbooks. When I am full of love, others are more welcome in my world, I am able to be present and be patient. I have a wonderful energy, a loving energy, of a woman with a full tank. I appreciate the love around me and give without needing back. And I am definitely happier. No bitter old woman brewing over here! Express your self-love: Look in the mirror each day and say it, or write a card to yourself. It’s amazing how hard this ‘simple’ task can be, it may even feel awkward, but I encourage you to try it today. Of course you love yourself, so what’s so hard about saying it? Know your tank and it’s level. Do what you love: Do one thing you love, start today and do it consistently. Everyone needs one thing they love that feeds their soul. Make it a priority. Even if it means the kids or work get one thing less. Fill your tank. Let go of an expectation: In a world of winning and getting our list of expectations from others and ourselves is constantly growing. Take the one that is weighing you down and making you feel stressed, or insufficient or sad and let it go. It’s like a hole in the tank, its draining you and you don’t even know it. Random act of kindness: Whether its a stranger or charity, give with no expectation. It’s not the same as giving to the same old day in day out. This is a giving that actually is a form of self-love, its the best kind and keeps the tank rising. So, go ahead, love yourself first. Then love and be loved. And the next time life requires you to ‘love harder’ do it with great love. 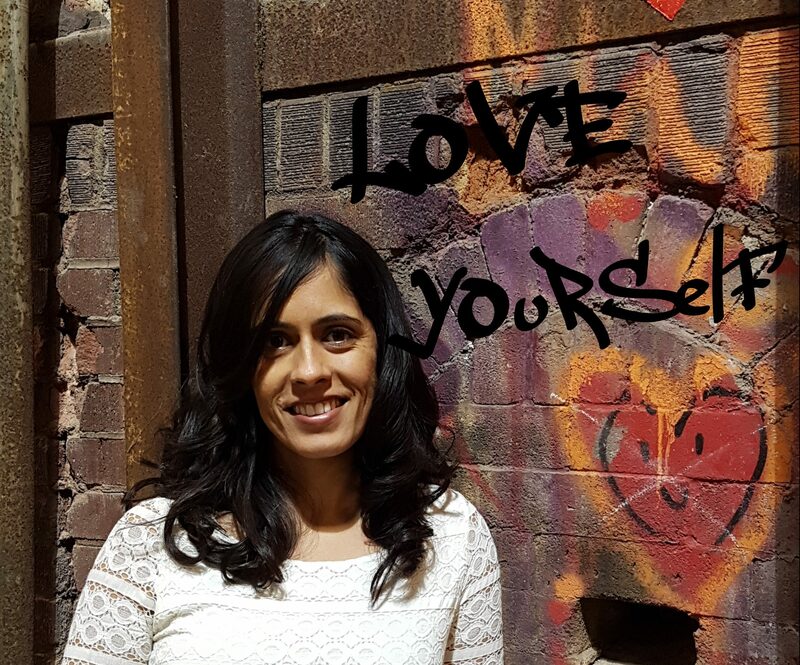 Khush Sra is a Toronto based holistic nutritionist on a mission to help women shift from surviving to thriving in life. Her passion though is to support women through mindfulness and nutrition. Having healed herself from endometriosis, hypothyroidism, infertility, corporate burnout and having supported her mom through a battle with stage 4 cancer, she has practical real life experiences with how holistic nutrition and mindfulness can improve our health and happiness. Khush raised her family of 3 kids on a whole foods, plant based diet and has helped families with developing strategies that keep meal time healthy, delicious and fun. Read more…..